What's Beef? "—I wonder if he had any idea that the answer would one day be "syntax and intellectual property." But syntax and intellectual property were certainly at the heart of Ludacris's beefy new diss record aimed at younger rappers Drake and Big Sean. When Notorious B.I.G. posed one of the most famous rhetorical questions in hip-hop history—"What's Beef? "—I wonder if he had any idea that the answer would one day be "syntax and intellectual property." 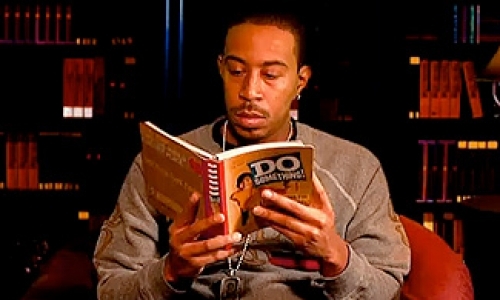 But syntax and intellectual property were certainly at the heart of Ludacris's beefy new diss record aimed at younger rappers Drake and Big Sean. The song, "Bada Boom," caused the usual html-shitstorm upon its release in mid-November, even though the seeds of Ludacris's anger were planted earlier this year when Drake and Big Sean alluded to him in separate interviews as having coopted a figure of speech they claimed to have popularized—something known informally as an "anti-simile." The anti-simile, or "supa-dupa flow" as it's called, is a simile that does not make use of the preposition "like." The opening verse of Drake's 2009 song "Forever" contains a lot of them: "Swimming in the money, come and find me: Nemo." In this particular line, and other anti-similes like it, a pregnant pause after the colon takes the place of "like." And that's basically it. It's not a very difficult or impressive lyrical innovation; it is hardly even clever. It was a micro-trend in hip-hop lyricism that, like so many before it, came and went. But far worse than the implicit accusation of intellectual property theft levelled by Drake, 25, and Big Sean, 23, was the even more damning implication that Ludacris, 34, was doing the rap equivalent of being the old guy at the bar. "I wish they had left that for people who know how to use it," says Drake in the inciting interview. And the people, it can be assumed, who "know how to use it" are younger rappers like him and Big Sean, not old fogeys like Ludacris. Drake and Big Sean whining about their trendy, uninspired deletion of the word "like" from their raps reminds me of another young twenty-something's lame attempt to put a copyright symbol next to that word: [pregnant pause] Zuckerberg. In his fiery retort, Ludacris made an "open source" appeal not unlike the kind found in Jonathan Lethem's new collection of essays, The Ecstasy of Influence. The salient lines of Ludacris's "Bada Boom" are, "Let me explain, nothing's been new since Big Daddy Kane / Flows'll get recycled, passed around to different names." Or as Lethem says, by way of John Donne, a.k.a. MC Bell-Toller: "All mankind is of one author, and is one volume; when one man dies, one chapter is not torn out of the book, but translated into a better language." Sometimes it pays to listen to the old guy at the bar.